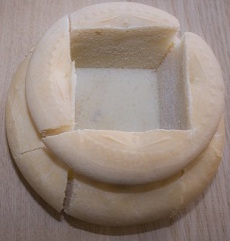 Antidoron (from Greek, meaning “instead of the gifts”) is the remaining bread from a loaf of Prosphora, after the Lamb has been removed for the Holy Eucharist. Historically, it was distributed only to those who had not received ‘the Gifts’, Holy Communion so that they would receive a Blessing in place of Holy Communion, but this practice has changed over time and those present may receive Antidoron as a blessing. Antidoron is not Holy Communion. It is a way of participating in the worship for those who may not be prepared to receive the Holy Mysteries. Remember, Antidoron is not the Body of Christ but it is blessed and deserves our great respect. It should be received and consumed reverently, carefully and completely. Make sure that crumbs do not fall to the floor. If crumbs do fall, pick them up and consume them. As it is our custom to venerate the cross and the icons on the tetrapod, at the conclusion of the Divine Liturgy, please receive a piece of Antidoron from the tetrapod.